This entry was posted on Tuesday, March 10th, 2015 at 8:00 am	and tagged with Linda Godfrey, Mysterious Universe, Nick Redfern, werewolves and posted in Cryptids, Cryptozoology, Magic, Monster Hunting, Monsters, Occult, Paranormal, Paranormal Investigation, Shape Shifters, Werewolf. You can follow any responses to this entry through the RSS 2.0 feed. If werewolves were real makes me wonder what else could there be? I love werewolves, and I actually prefer them to vampires. However, I’m not sure I believe in the existence of actual shapeshifting bipedal wolves. I think werewolves are really just powerful magical symbols that represent a wide variety of things. That being said, I do believe that some of the people who see they call “werewolves” are actually seeing real things; I’m just not sure that these things are really “werewolves” in the common sense d the term. That’s what I think, anyway; I not claiming to know the objective truth on the matter. I have always laughed at all the paranormal romances that face a person with a choice between a vampire and a werewolf lover. What choice? Cold blooded, undead bloodsucker vs. live, warm blooded, werewolf (who incidentally is not a wolf all the time)? Seriously, though, my point in writing this piece was that there are many ways that bipedal wolf/werewolf ‘being’ could manifest. Are we going to ‘get to the bottom of it’? No. Even if we could capture a specimen (highly unlikely), that being would only explain one particular manifestation of what is a decidedly strange phenomenon. 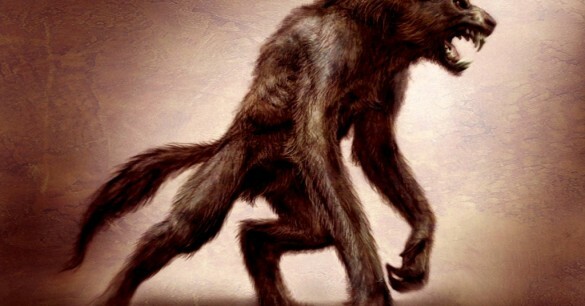 I’d have to lend support to the skepticism of there being a bipedal wolf-creature out there. One of my degrees is in Anthropology. While I mainly focus on cultural anth, I’ve studied enough physical anthropology to believe that it is likely that constant bipedalism was a result of brachiation and mutations that lead toward bipedal locomotion, which was advantageous, thus natural selection took its course. Note, ancient African forests existed before the savanna stage and bipedalism was well-developed before the landscape changed to a primarily Savanna scene. Bipedalism greatly aided here too, thus no extinction event occurred along with this change. The other great advantage of bipedal locomotion is that it allows for encephalization, that is, it allowed for the growth of the head and thus allowed for much larger brains. Obviously a smarter animal has more advantages, but the big old brain came later. So, if a mutation for a bipedal wolf/canine creature occurred, it would likely be advantageous, right? Well, not necessarily. First, a larger head would appear later in evolution, so this isn’t an immediate advantage. We have to assume that the bipedal creature is capable of attracting a mate despite its mutation. It would still need to be stealthy so it could hunt for food (unless it also learns to rely on scavenging) and to hide from humans who I am sure would love to catch ’em a walking dog creature. The point of going through all the great stuff about human bipedalism is to show how it took a really long time to become dominate and how each step in this evolution was advantageous. My issue here is that wolves or wolf-like creatures walking around on two legs do not exclusively appear where breeding populations of wolves and wolf-like creatures live. Yet, werewolves are sighted all over the US and in parts of Europe. Sometimes multiples of these creatures have been spotted in the same area (either suggesting a breeding population or suggesting a set of mutants from the same parent). The advantages of walking on two legs for a stealthy wolf is questionable and there does not seem to be a lot of evidence that in the existing wolf populations (which are tracked and closely monitored by researchers, experts in wildlife science) any cases of bipedalism have been observed in the breeding population. Lastly, consider the dog, which is descended from the wolf. It is the most diverse mammal on the planet, with more breeds than even cattle. Yet, even within all these breeds, all this genetic variation, no one has ever developed a breed that primarily walks on two legs. Sure, we have some dancing poodles, but it isn’t a natural form of locomotion even for these dogs. Other explanations are much more likely than bipedal wolves.